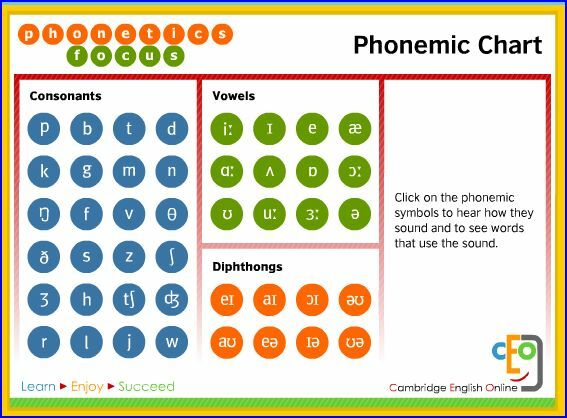 A company called Cambridge English Online Ltd has a website offering, amongst other goodies, a ‘phonemic chart’ showing the IPA symbols for the sounds (‘phonemes’) of English, with associated sound files enabling you to ‘click on the symbols to hear how they sound and to see words that use the sound’. A purist might complain that you can’t pronounce a phoneme as such (still less a symbol), but only one or other of the allophones that manifest the phoneme — for example the r in red is different from the r in tread and the r in dread, so that you can’t adequately illustrate them all with one single sound clip; but by now we are used to teachers of EFL wrongly calling phonetics ‘phonology’ and speech sounds ‘phonemes’. No matter. When you click on the symbols, however, you find something more disturbing. Clicking on a vowel or diphthong symbol is fine: you hear the corresponding sound (though their ʌ sounds a little bit odd to me). But when you click on a consonant symbol, in some cases you get the corresponding sound, perhaps lengthened (true for ŋ, s, z, ʃ ʒ, tʃ and r, for which you get ɚ), but in other cases the corresponding sound plus schwa, thus pə, bə, tə, də, kə, ɡə, mə, nə, fə, və, θə, ðə, dʒə, lə, jə, wə. It is particularly confusing to treat different nasals differently, nə but ŋː, different liquids differently, and different affricates differently. No one should be taught that the w in well, for example, is pronounced wə, because that would make it wəel. It’s the usual problem: people making pronunciation practice materials don’t get advice from a phonetician, but imagine that every native speaker is an ipso facto expert. Remember, when it’s language, people never check. They never call a linguist. They just make stuff up. 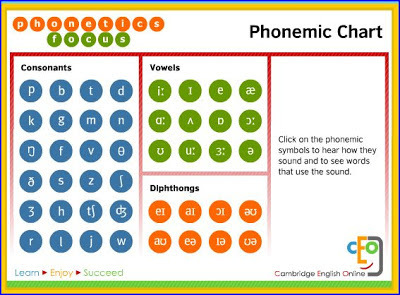 Anyhow, we mustn’t complain too forcefully, seeing that the site is free and also contains jolly games such as ‘Phonemic Hangman’ and ‘Phonetic Pelmanism’. Clicking on "about us" tells you: "[...] we now create an increasing amount of resources for other subject areas, both for educational and edutational uses, [...]". I assume that edutational is meant to be related to edutainment (it's clearly not just a typo for educational because it's specifically contrasted with that), but their use of what is clearly a very minority neologism doesn't inspire all that much confidence. Anyway, people tend to think they know about language because they can talk, can't they. For the same reason, foreign-language linguistics tend to attract some native speakers who have no interest in linguistics whatsoever, because they think they won't have to learn or study anything. /r/ in 'red' is different from /r/ in 'dread'; how so? I get the devoicing in 'tread', but 'dread'? I'd always assumed that in dr- words, it is the /d/ that acts funny -- acquires a mild /dʒ/-like property (or sound), but a different /r/ is completely new to my (limited) phonetic knowledge. Do we have a different allophone in 'green' perhaps or, maybe, in 'brine', 'Sri Lanka'? See this handout or textbooks. r in dread is realized as the fricative part of a voiced postalveolar/retroflex affricate. I just recorded my citation form of "dread", and cut off the affricate at the beginning using Praat. It sounds like a pretty convincing "red". So I think Samopriya's description is closer to what I do than the usual description. I don't find much to object to in the practice of exemplifying a consonant by attaching it to a vowel, as long as users have it explained to them. I certainly did it for many years as a phonetics teacher. In material that I'm working on at the moment, which presents vowels and consonants in isolation, I begin by saying "When you listen to individual consonants, you will hear a vowel pronounced after the consonant; many consonants are very difficult to hear unless there is a vowel pronounced after them". It would take a pretty dim student to think that you have to pronounce 'well' as wəel because of this. I do agree, though, that all consonants ought to be treated in the same way. good joke, Peter. I have had many students in my life (a sentence which David Crosby will not censure as incorrect in English, I hope) and quite a few of them were as dim as that, nay, much dimmer. Seriously: depends on how much the student knows about English (especially 'Cambridge English'...) or how close his native language's phonetics and phonology (and phonics?) are to English's. Have you ever tried to learn a really exotic language, e.g. Yaghani? Or perchance Tubatulabal? If you had, you'd have seen how utterly confused you were about its sounds and how prone to make assumptions which to the natives must have seemed as idiotic as [wəel] is for English. As a teacher of teachers who teach reading and spelling to young children, I have to say that it doesn't help at all when teachers say a consonant sound with an accompanying /uh/ sound. This is because if people say sounds with the added /uh/ all the time, it is much harder to hear the word. Thus instead of 'mat' or 'crab', we get 'muhatuh' or kuhruhabuh'. However, I wouldn't want to fall out with you Peter as I am always recommending your book (English Phonetics and Phonology) to teachers. We also find your description of consonant sounds that can be elongated (/m/, /s/, /sh/, etc) as 'continuants' very useful in our teaching. 'John': to post a comment here, you MUST use your true full name. Otherwise your comment risks being deleted. And please use proper phonetic symbols, not "/uh/" etc. Sorry, John. My name is John Walker. I'll post as that in future. I'll remember to use proper phonetic symbols too. This makes me curious how people here pronounce the word schwa. I know of three pronunciations: /ʃwɑ/ /ʃvɑ/ /ʃvə/. I know a linguist and Hebraist who uses /ʃwɑ/ for the sound and /ʃvə/ for the Hebrew vowel sign and what it represents (in Modern Israeli Hebrew, either nothing or [e]). Speaking only for myself, I pronounce it — perversely — with a long vowel: ʃwɑ:. I say---if this be of any interest to you---mostly [ʃfa] because my Polish phonotactics leaves me no choice---it knows no [ʃv] and I don't like the sound of [ʃwa] (actually there is a Polish word that sounds exactly like that, it means 'she walked'). But sometimes I take pains---mindful of the Hebrew origin of the word---to say שְׁוָא with the vowel itself between the 'shin' and the 'waw'. David: /ʃwɑ:/ to be sure. In notating pronunciations that are my own or close to my own, I do not write vowel length marks, for all my vowels are phonologically short. I too found their STRUT funny, rather highish-backish conservative-American, but that was I think because the vowel was produced in isolation, not in a real word. You hardly ever say just '[ʌ]', and if you say 'huh?!' it sounds rather like CEO's [ʌ], does it not. True real name is revealed at: PROFILE (Google blogger). To my ears, the eə on the website sounds like [ɛ:]. I know that this is the pronunciation used by a large proportion of English people, but the site puts in the diphthongs section. Maybe it's still felt and heard as a dipththong by the English, I'd think so. It sounds like a centring diphthong to me. The first element may be more prominent than the second, but it still sounds like there is movement toward the center of the vowel space. There does appear to be a slight downward drift of the second formant during the sound, which doesn't appear in my own pronunciation. There can be off-glides in a monophthong though. I detect one in the recoding for ɔ: on the website. Jack Windsor Lewis said in section 9 here that the view of [ɛ:] rising to dominance in recent years is not entirely correct. I post this because I think that it is a very insightful analysis by him. I always thought "off-glide" was another word for what I would call "the second part of a diphthong". Maybe that definition is wrong though. I agree that there is also an offglide in the site's /ɔ:/, and actually I think I hear one in its /ɑ:/ too. Perhaps these offglides are more likely to appear when recording the sound in isolation than they are in normal speech? @ Jason Reid: This is the definition that I was using for an off-glide. who can help me? I need to know how to stress chocolate chip cookie. Like other food names: ˌchocolate ˌchip ˈcookie (compare ˌham ˈsandwich, etc.). In BrE, at least. Thanks a lot, John. I find compounds very confusing. In my impression, Bostonians tend to pronounce the first vowel of 'Boston' with a kind of lowered, backish schwa or some such: Bo-aston, Bo-uhston, Bo awston, some such. Maybe it's a particularly affectionate way of saying 'Boston'. But anyway, there is a sociological aspect to the above event (the SCRABBLE PR lady vs Prof. Wells): experts quite often tend to put off or intimidate laymen turning to them for advice, make them apppear stupid and confused, not intentionally but just because they are experts, i.e. see things deeper and more thoroughly than 'punters' (as David Crosbie would say). Dear Prof. Wells (SOME expert...) what are the most frequently mispronounced English words. Answer: it all depends on what you mean.... But the poor SCRABBLE lady --- a flea against a giant -- just is not sure what she means. It's like at the doctor's: I have a pain, it aches.. Doc. But could you please kindly describe the exact localisation and quality of your 'pain'. Except that with doctors, when it really aches, we swallow our pride and let ourselves be humiliated. But individuals like the SCRABBLE lady will simply not turn for advice to a linguist any more, I fear... I am saying: this is inherent in the definition of the situation, not due to the superciliousness of the expert (which I am sure looms large quite often but was absent in the case in hand).